Do Your Taxes Online the Easy Way - HBS Financial Group, Ltd.
(GAL) – Quite often it doesn’t make much sense to have a professional handle your taxes. There are many reasons why it makes more sense to do your taxes online yourself. It all boils down to cost. When you consider the fees charged by professionals versus the small fees to file your taxes online, its a no-brainer. During the 2018 tax season, the average fee by a pro for a federal and state return using the standard deduction, was $175.00. Filing the same return using itemized deductions, the total fee was $275.00. Say you had a side gig and had to file a Schedule C, the total fees would be in the area of $450.00 and up. In some areas of the country where the cost of living may be higher, your total fees went well beyond the $450.00. There are a lot of vendors listed on the internet for doing your taxes online. If you’re looking for a low cost solution, check out our affiliate software firm at 1040.com. As an example, if you qualify to file a Form 1040EZ, you can file your federal tax return online for free. If you have a very complicated tax return and don’t have a clue where to start, you may want to contact a professional. However, most tax returns today are fairly straight forward. For the tax year 2018, more and more individuals will be filing a return using the standard deduction because of the new tax law. So, if your tax return is in that category, don’t waste your time and hard earned money taking everything to a tax professional. From the comfort of your home, you can do your taxes online quick and easy. Our highly intuitive software at 1040.com will walk you through. Just because you’re filing taxes online yourself, don’t think that if you have a question or need help, there won’t be a professional available for you. You’ll find e-mail or online chat quickly available should you need it. We have so many first time users that were apprehensive when they started, but by simply answering questions, their tax return was literally prepared for them. Its that easy. Our database of online clients run from college students to retired folks and their testimonials confirm how easy it really is. For the majority of individuals though, doing taxes online themselves, is the most advantageous. This is not a coincidence however. 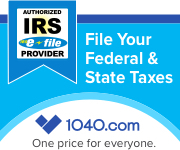 The folks at 1040.com have worked very hard to make their program simplify many complex tax situations. In plain words, they designed it with you, the user, in mind. So, no matter what your tax situation is, give this great program a shot, and do your taxes online. There’s no charge for trying it, so you have nothing to lose. Take our free, no obligation trial now and see for yourself. For the past three years, my wife and I have been going to a local CPA at the insistence of my father-in-law. We had the usual itemized deductions, nothing out of the ordinary, and paid this guy 275.00. After seeing your site, this guy is history. Thanks Barry. Come back when tax season rolls around and we’ll be glad to have you. I can personally attest to those high CPA fees you mentioned in your article. I live in upstate NY and they must think that everyone who lives up here has money to burn. I got ripped off the past two years, but no more. My return isn’t that hard to do, and I know I can do it on your site. Thanks Rebekah. You’re in a high cost of living area and those CPA fees can really climb. Come back here when you’re ready and our low cost will please you. I usually itemize my deductions and had a Form 2106 tied in with them, but it looks like that is all behind me now. There are no more miscellaneous deductions, and losing that, I won’t have enough to itemize and will be using the standard deduction. My main concern though, is my state return. If I can’t itemize on the federal, I also can’t itemize on the state. Hi Allan. Yes, be sure to check your state return now and see how they will handle the new standard deduction versus itemizing. Get notified when new posts are published.